Been a lot of discussion lately with pulley sizes and some people are still a bit confused on how the pulley ratios work. HD's come stock with a 3.25" upper and L's come stock with a 2.93" upper. Both trucks come with the same size lower. HD's stock are 6 lbs of boost and L's stock are 8 lbs of boost. Aftermarket pullies are named for the boost increase they add on a Lightning, NOT a harley truck. A 6 lb'er adds 6 lbs to a Lightning, it does NOT add 6 lbs to a harley truck. The rough general rule of thumb has been 2 lbs less for a HD, but since its a ratio, this isn't fully accurate. From a generalized standpoint, boost is a linear function of blower RPM. More RPM = more boost. While up high this is not true because hot air is less dense therefore less boost, and low RPM its a bit different as well, the generalized ideal boost level vs RPM for the middle of the "s-curve" of boost vs RPM can be linearized. That thread was our sticky for a while, but with everything in text form for some its a bit harder to interpret. I took Ryan's approach and threw it into a chart and a table that should clear it up for everyone. The second table is the pulley combos for least to most boost on any truck depending on the combo of uppers & lower's. So a 4 lower & L upper makes more boost than a HD upper and 6 lower, etc. 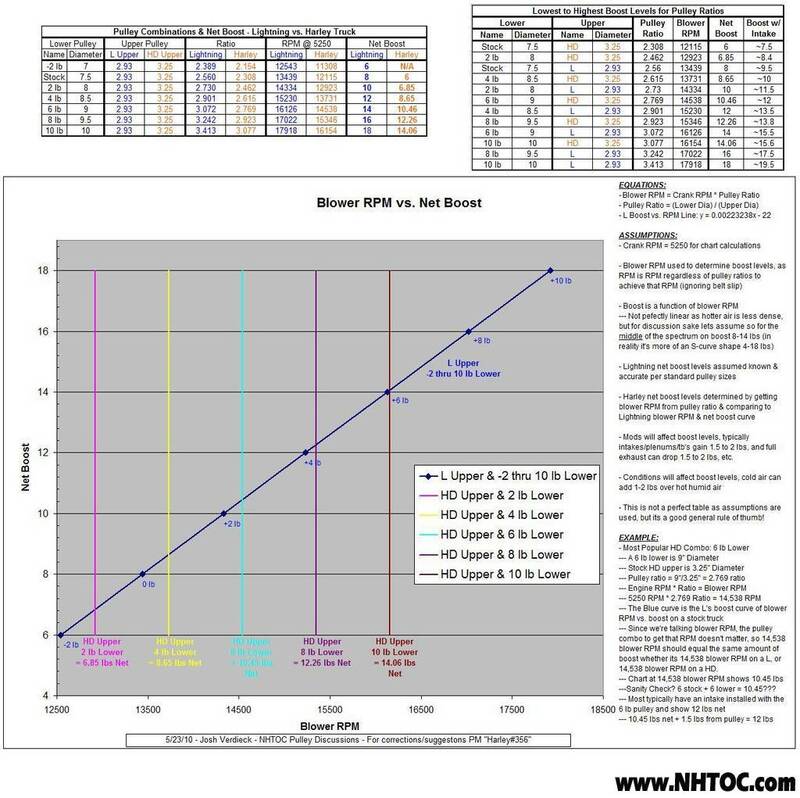 The chart is blower RPM vs net boost for the known L pulley combo's, and where the HD pulley combos fall into place at. This chart and tables are up for discussion as I may have overlooked something, but PLEASE READ THE ENTIRE LIST OF ASSUMPTIONS & EXAMPLE ON THE RIGHT OF THE CHART BEFORE BRINGING UP DISCUSSION POINTS!!! Looks like you spent a lot of time making that. It looks good and hopefully should explain better. Thanks for taking that time. Helped out having your post in the other thread to give the gears in my head a kick start on putting the chart together I'm an engineer so I like numbers and graphs haha. What better way to spend a sunday afternoon right!? Great info josh once again pulley concerns covered. What you did is absolutely great collaboration of all the stuff that has come before! I hope your effort finally puts this issue "to bed" ... speaking of which? ... you probably need to spend more time in bed getting laid instead of doing "truck stuff"!! Great stuff Josh... amazing how a HD with a 6# lower is spinning at nearly the same ratio as a L with a 2#. Your numbers and assumptions are right on. Thanks for taking the time to do this. me doing my s/c conversion on Jekyll really got me thinking about it more. I was only going to do a 4 lb lower to keep the boost lower since I only wanted around 10 lbs, but with a HD upper and 4 lb lower thats only around 8.5 lbs. The full exhaust is going to offset the boost gains of the intake mods, so I'm still going to end up around 8.5ish. Just got off the phone with LFP, they're getting a 6 lb lower to me by Wednesday for my Dyno on Thursday!! i still think your wrong but i have no arguement. Well thats no fun! Discuss! Whats the reasoning for thinking its wrong? I do agree it is hard to argue though LoL! Blower RPM = Boost. I know some guys want to say a 6 lb lower still adds 6 lbs on a HD. And the HD upper just yeilds 2 lbs less net boost than a L, and therefore a 6 lb lower on a HD is equivalent to a 4 lb lower on a L, but then you'd be saying that a 6 lb lower on a HD turning 14,538 RPM's makes the same net 12 lbs of boost as a 4 lb lower on a L turning 15,230 RPM's. 692 RPM difference in blower RPM is certainly worth some amount of boost! So a HD can't make the same 12 lbs net turning 700 RPM slower! Nothing magical there The L combo with a 4 lower is turning 11.5 times more per second than the HD combo with a 6 lower, that most certainly creates more boost. I just got into this little argument the other day....it is hard to argue with numbers.